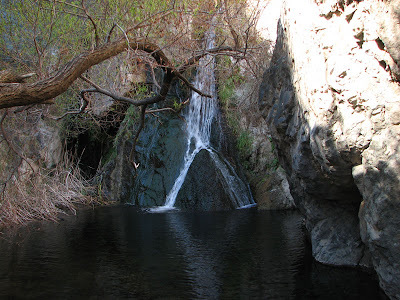 A couple weeks ago I was in Death Valley and decided to hike to Darwin Falls. To make it more interesting, I drove the 4wd route from Darwin down to the falls. 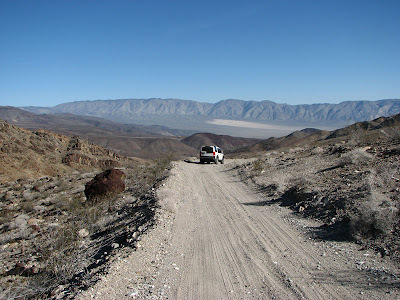 Here's a photo I took along that road with Panamint Dunes off in the distance. The road was much easier than the last time I drove it. The book Hiking California's Desert Parks says this hike is 3 miles (round trip) and takes 2 to 4 hours. It took me 20 minutes to hike to the lower falls from the parking area. There are actually 2 sets of falls totalling about 80 feet, making it the highest waterfall in Death Valley National Park. It was a pleasant hike. The falls area is shaded and a great relief from the sun and heat. It required some easy rock scrambling and crossing streams by walking across fallen trees. I strongly recommend bringing trekking poles or a big stick for balance (there are several left by other visitors at the parking area). Here's the NPS web page with a little information. All in all, this is a great diversion for anybody traveling in this area of the park. Afterward, I drove up near Father Crowley Point to hike around Rainbow Canyon and onto the Darwin Plateau. Just because. Anyway, I was also hoping to catch a glimpse of military jets flying down Rainbow Canyon. It ended up being a good news - bad news experience. The good news: after I parked and while I was preparing for my hike, 2 F-18s flew right over me and dove down Rainbow Canyon. Wow! Very exciting. The bad news: my mopey camera is too slow to take a photo after power-on, and I didn't get a single shot. Here's a shot posted on Flickr by somebody luckier than me.